Toto zboží již není aktuální, pokud máte o podobné zájem, můžete nás kontaktovat - pokusíme se Vám jej sehnat, tato služba je ale bez záruky. In the new fantasy adventure Avatar - Setting out for Pandora the famous Star Director James Cameron takes us to a fascinating new world that lies beyond our imagination. Together with Jake Sully (Sam Worthington) we dipped into the 3D fascinating story and go on an exciting journey full of danger and discovery. 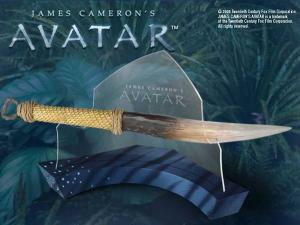 This authentic, amazing replica is a screen accurate reproduction of the original ´Na´vi Braided Dagger´ as seen in James Cameron´s Blockbuster ´Avatar´. It measures approx. 49 cm in overall length. A display base for a stunning presentation is within the scope of supply.